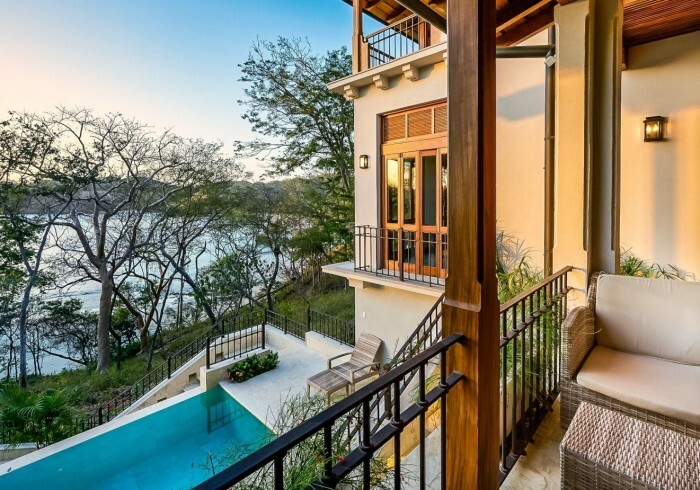 Casa Alouatta is a five bedroom house able to fit up to 14 guests. The home has a private swimming pool, beach access and a yoga space with beautiful views. Alouatta is the scientific name of the Howler Monkey, which is commonly found in Guanacaste. The main house has a spacious gourmet kitchen with floor to ceiling windows allowing the natural light to come in through the day. The main living room is next to the kitchen and the second one is on the ground level next to the guest bedrooms. The master bedroom is located on the third floor of the home with a king-sized bed and sweeping ocean views. This bedroom has its own private terrace with views to the swimming pool and the ocean and a spacious bathroom with views. The guest bedrooms in the main house are located on the ground level with a shared bathroom. From the terraces of each bedroom you are able to access the beach as well as the swimming pool.